I ended up working at a small specialized private school soon after getting my graduate degree last year. The school has a high staff to student ratio and is heavily focused on pragmatic and social learning. I have access to basketball courts, standardized assessments, continuing education opportunities, and many other pediatric resources. What happened during my first few weeks challenged me both professionally and personally. Here is some advice I wish I had before walking in the door. It is difficult to learn all the ropes of a new job, especially in real time in front of students. I was warned the students would test my boundaries and that couldn’t have been more correct. For one example, a 19-year-old student used profane language in conversation with me throughout our first session. I passively let it slide, attempting to establish rapport by using casual verbal reminders that those words were not acceptable. I wish I had been firmer because his awful language continued for several sessions despite my increasing cues to stop. During a 1:1 session, my supervisor walked by my office and heard him swear. She stormed in, put a stop to the behavior, and appeared very upset. Even if you’re an entry-level professional and a new employee, behavior expectations are set from the first moment and that trumps building rapport. I suggest establishing consistency in your behavioral expectations as soon as possible. It may be beneficial to go over those expectations with your supervisor before your first day. This ensures consistency with the philosophy, policies, and behavioral expectations of the school as well. Students at my school experience severe difficulty in managing their frustrations and disappointments. In my first week, one student decided he didn’t agree with my OT session plan and yelled in my face to leave him alone in my gym. He forced a chair over and ran outside of the building into the backyard. Our staff are equipped for these situations and all manage walkie-talkies in constant communication with each other. Once several staff members responded and I was relieved back to my office, the event kept replaying over in my mind. It was alarming and felt so personal. I cried in my office afterward thinking he may get in trouble because of an incident while on my watch. I wondered what could I have done differently and how to get him to forgive me. It took days of returning to work and interacting with that student before I realized he wasn’t angry at me. In fact, he didn't even really think about me, ever. Students are often internally consumed by their own egos, perseverations, and developmentally appropriate tunnel visions and rarely behave while thinking on your behalf. Do not automatically think any behavior is because of you. Do not hesitate to try new things that the school doesn’t seem to be doing yet. A new OT with fresh ideas, new projects, and activity-based interventions was exciting for my fellow staff and students. One of my new students had been repeating the same visual perception program on the computer that was given to the school by his Functional Ophthalmologist. After checking in with the student’s doctor and parents, I began replacing the computer program with scavenger hunts around campus, basketball passing and shooting drills, and some baseball skills. Don’t hold back on your creative inspirations. Nothing is too quirky or extravagant for kids, especially when you have the resources. I quickly learned that some students wanted to know everything about me, including my mother’s name, my address, if I was single, and when I planned on having children. In my first week, one student asked me what I wore to bed at night. I answered, ”my pajamas.” He asked me what color they were, and I answered blue. He later announced at dismissal in the very busy hallway that he was going to see Miss J (me) in her blue pajamas tonight. He actually, to this day, still talks about my blue pajamas to staff and students. During my first few days, many staff members provided valuable insight into specific students, their histories, and their common behaviors. As I got to know them over a few weeks, this information began to feel malleable and even incorrect at times. Consider these new insights as relevant and necessary pieces to the puzzle but do your own fact checking of the students’ records. Yes, a teacher or counselor may have more of a relationship with a student than you at this new stage, but they do not interact with the student using the same lens. Do not let another staff member’s opinions change how you would naturally approach a new student or alter how you perceive a child. The teacher or counselor may analyze the student’s presentation for many other reasons and these behaviors may not be the child’s natural routine or comfortable self. Every staff member repeats to you in the first few days, “don’t take it personally” when a child yells at you or blows up in your session. You may think your skin is thick and you do not allow the interaction to bother you until later at night when it consumes your thoughts and prevents sleep. I am a sensitive person who’s always enjoyed working with kids but when you’re a sister, nanny, or camp counselor you hug them when they get hurt and help with their socks and shoes. Those are very nurturing roles. In a private school with a population that deals with sensitivities in sensory processing and has experienced stressful school exposures, students often have adverse reactions throughout the day. It is our responsibility to teach independence and promote self-motivation, and that often provokes frustration or anger towards you. Sometimes a student’s emotions can just be running quick, hot, and high that day. We may never know what happened before they came to school or what their home life is like. Again, remember your purpose; Not necessarily to be well-liked but to provide coaching and a venue for the students to achieve their goals. If a child is frustrating you or pressing your patience, it is vital your reactions and emotional responses remain therapeutic and not purely uninhibited. At a private school like mine, the student body struggles with self-esteem, appropriate and pragmatic interaction skills, maintaining relationships, and controlling their own anxieties and emotions. Rapport and relationships are fragile and guide so much of the student-therapist relationship. One shy preteen student within my first week said to me, “I can see I am annoying you.” This broke my heart for her to interpret my face and nonverbal language as annoyed despite me denying it. Be hyper-aware of your own body language and positioning, tone of voice, and especially your own triggers and frustrations. Even when the student does not appear to be hyper-vigilant about you, be hyper-intentional with your reactions and non-verbals. Private schools can hold OT responsible for many elements of the IEP outside of direct OT objectives; I often write objectives for transition planning and sensory breaks. Each subsection is gone over in detail at the meetings. I became stressed when the first progress notes and IEPs were due because I didn’t fully understand where I needed to document and by when. Be sure to know how to access each section of the progress notes, current performances, and IEP sections right away. I suggest making a power list for yourself to keep track of the IEP meetings, evaluations, and update schedules and confirm it with your supervisor. I walked into my first IEP meeting with no clue what to expect. There was a district representative, two parents, a handful of academic staff, plus my supervisor, and me at a large table. I was scared my voice was going to tremble when I spoke or they were going to challenge every thought I shared. My whole body was tight and I probably looked like a statue or a manikin. Before you walk into the meeting, breathe and remember the focus is on the student, not you. You are the professional that has all the skills and credentials necessary and you know what you’re advocating for and talking about. Again, try to take your ego out of the meeting. Do not be intimidated by talking with parents or district representatives because you all have the same objective. Just be prepared. After triple-checking my reasoning and research for each meeting, I found most parents just trusted me. 10. Be your own OT! Transitions are difficult, and we don’t often set up our own environment for big changes. At a private school like mine, the end of the day can feel emotionally and mentally depleted. It is important to consciously make time to wind down after work with a plan or preferred activity. For me, working with special education students from ages 6-22 creates a wide range of stress and challenges that sometimes stick with me long after work hours. To avoid serious burnout, try not to think about work every hour of the night. You will be tempted to let your mind wander there because you are new and want to do a good job. Purposefully create something else to help you relax. I enjoy running after work because I seem to process things very thoroughly while I’m exercising. Then I go home with a clear head, at least for a little while. You need that time or else it might feel like you never left the office. Working at a private school allows me to access resources and provide well-developed and comprehensive treatment plans to children who require specialized social-emotional care. I love the idea that I am preparing young men and women to be successful participants in their community. It is my job to aid in the investigation of what is most motivating and successful for my students, advocate for the goals and the interests of their families, and help plan a smooth transition to the next step. I love guiding a student towards accomplishing a first-time job interview or watching them push past their discomfort and ask a new friend to a play game. A private school demands you to be self-motivated, creative, flexible, and in control of yourself beyond your personal expectations. 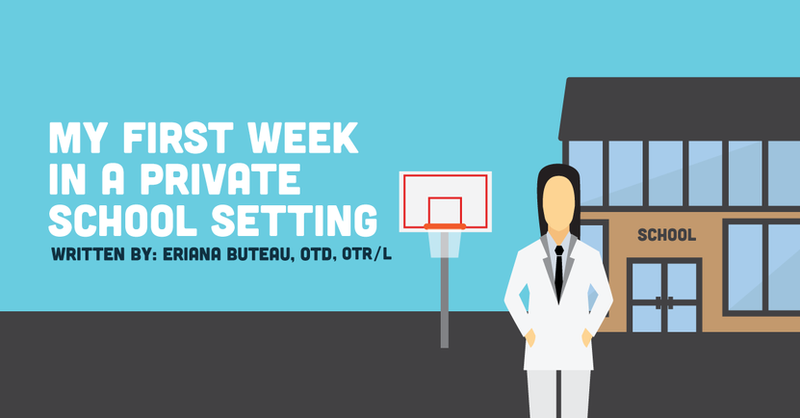 It is a challenging but satisfying place to work, and I feel grateful that I landed this as my first OT job.